In early October, I blogged wistfully about my experiences as an online grad student and highlighted a spanking new teacher PD project that we were initiating at LEARN: Web Events. Each month, an educational topic, tool or approach was presented via ZenLive (our online platform), to intimate groups of interested folk from Quebec and beyond. Following each live event, an archive of the session, as well as many supplementary resources were made available to all. We did indeed have some very thoughtful presentations and engaging discussions around a wide variety of topics: from blogging in the literacy classroom, to the creation of visual journals, to the use of some really cool online tools in the social sciences, to flipping the class, to the impact of la féminisation in the teaching of FLS. These “tasters” allowed for teachers to get…well a taste…of each of the highlighted themes, as well as suggestions of avenues for further investigation, potential implementation and possible community building. One very interesting (and promising) offshoot of our monthly web events, was the creation of the web series. This emerging PD model currently involves taking a hands-on workshop, which would traditionally occur f2f over much of one entire day, and breaking it down into more manageable chunks (1 to 1.5 hr), which are then delivered at a distance using widely available online technology. Needless to say, I wanted to be a part of our inaugural sessions and signed myself up as both a behind the scenes supporter and a participant for We Can, WeDO & We Will! Robotics in the Kindergarten Class with Christiane Dufour. Christiane is a veteran educator, who has been providing teacher training and professional development in the integration of technology for learning since 1985. For the past few years, with her LEARN consultant hat on (just one of her many! 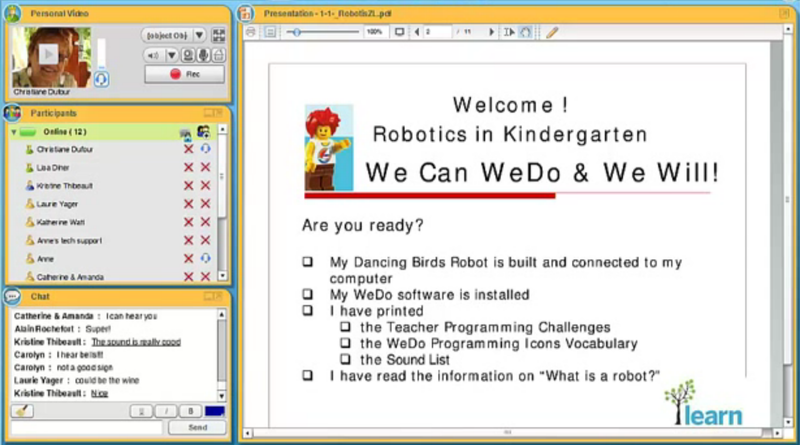 ), she has been giving f2f workshops to kindergarten teachers on how to implement a robotics program in the classroom. In my previous blog post, I suggested that in order for PD (of any permutation or combination) to be effective it had to meet the generally accepted benchmarks of quality. I interviewed Christiane last week and asked her how she felt her kindergarten robotics web series had done just that. Have a listen to what she has to say…some genuine nuggets about the planning, implementation, successes and challenges of providing good online PD. How were your sessions content or subject-matter focused with an understanding of student learning needs? How were you able to provide opportunities for active learning around authentic tasks? Tell us how you organized the sessions over time? How did you allow for feedback and follow-up? As evidenced by Christiane, the delivery of this type of PD should not be undertaken by the faint of heart. For the animator, it clearly involves a great deal of planning, preparation, persistence & follow-through. But what of the participant…did these sessions meet the needs of the individual, positively impact on practice and improve student outcomes? I am happy to report that we have the anecdotal traces to answer yes to the first two of these important questions, and I look forward to hearing more from you in response to the third and as part of a continuing conversation. Please feel free to leave your feedback or suggestions below.